Probably a problem on my end, but is still a little problem. The face appears to not change to what it looks like in the mods' screenshots. Other than that, it does what is intended. I like the added spells and redone stats. Definitely better with sneaking now than the vanilla version of Brelyna. I am using NMM, so, any possible explanation on why the face isn't changing would be appreciated. Thanks in advance. 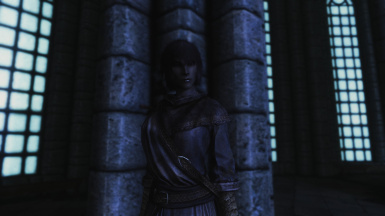 I can't tell if I would want this mod or not because I really can't see what she looks like. Might I suggest screenshots with a bit more light? Looks like the typical anime andros. What version of Apachii hair is required? I have Apachii hair installed, but I'm still getting a CTD. 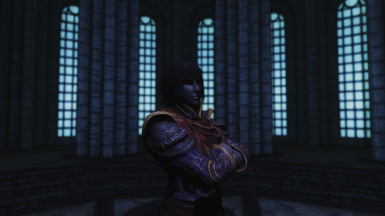 Also, what armor mod do you use in the last few images? Requires Apachii Sky Hair now. 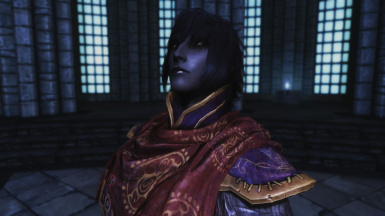 Removes the too violet/darkpurple skin color for the darkest Dunmer skin tone. 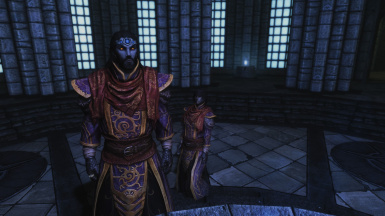 Fixes neck seam and other appearance bugs, while more or less trying to retain the original V1 and V2 looks. Also, functional bugs squashed. 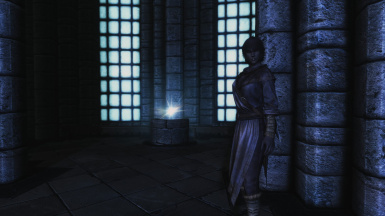 Improves Brelyna with Doesn't Affect Stealth Meter so she shouldn't now at all be capable of breaking your stealth. Other improvements include faster speed, so she catches up to you faster. Next, her AI behavior has been improved making her Aggressive to attack, Foolhardy to keep on fighting never quitting like before. Other small edits here and there. TLDR: Fixes most of V2's shortcomings. 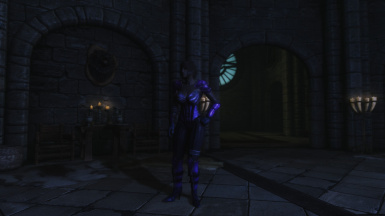 And yes, GuardianofLight, with V3 (that fixed the gaudy violet/purple skin tone color and neck seam issue, amongst others) for sure, it works with UNPB. Myself, I've become mesmerized by SevenBase. I was using UNP before that. Apachii Sky Hair is REQUIRED for this mod to function correctly, or hence the CTD. My apologies however because V2 DID NOT specify that Apachii Sky Hair was required for this mod to function. It was my fault. And also V2 CK method was the first time I tried it and I think I botched it up real well, since I kept having neck seam issues with it. I think all that jazz has been fixed with V3. 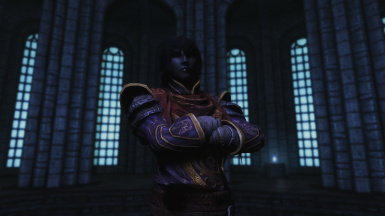 I'm about to upload Sihaya Ankaran, a Bosmer companion/spouse, in an effort to update my Bosmeri mod but separately this time. I'll get to Khajiits later. Well, nice to see you took another try at this. However, Im a little unclear why one would even think to have to mention appachi hair is required. Its pretty much universal at this point. Ive always had the most recent version of ASH loaded so, the CTD cant be because I lacked the correct master file, ive always had them. Right now I have 1.6 full, AND the 1.5 supplemental female pack. That aside, I loaded up your V3(still looking for a suitable BM replacer after all this time), and guess what? Immediate CTD. so whatever is in there, its still there, and its still CTD. So some other master file your mod points too must be missing. Maybe ill took a look at it later on in the CK. Sorry took so long pointing this out-I had this file off track or I would have gotten to it far sooner. 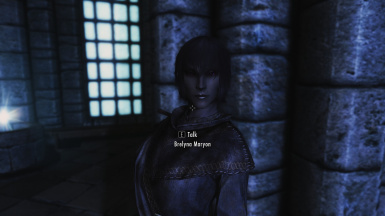 I really like what you've done with my ingame wife, by far the best looks for Brelyna I've found on the Nexus. Really good work there. 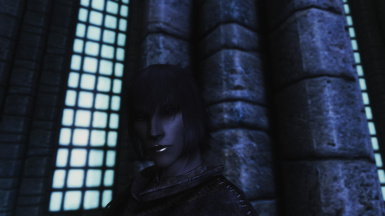 This is the only face mod for her that also replaces the hiar, in a way I somewhat enjoy. 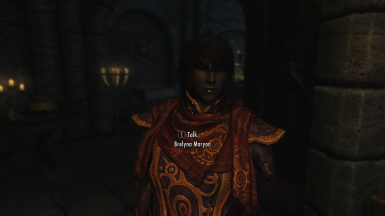 There is a better face mod in my opinion, mainly cause it keeps her elf style. But it doesn't change that nightmareish hair. Not to mention it doesn't work with my body mod. UNPB if your wondering. I hope this one does. 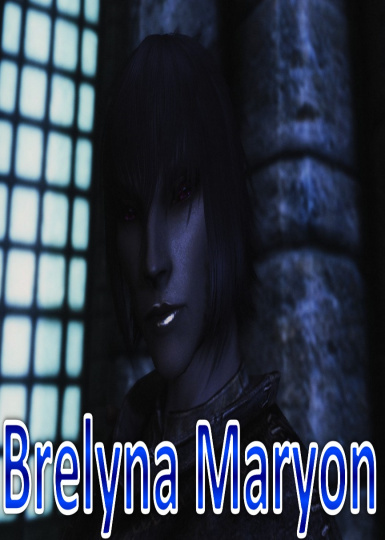 It's my last hope for a nice looking Brelyna. Well, that's not good. I'll try to recreate the issue, but Version 2 works for me, even with no other mods installed. 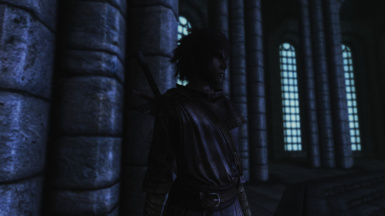 All the hair and char customization shouldn't be required for this mod to work. I aimed to correct and fix most technical issues by moving away from the outdated Version 1 method. Version 1 though is a very unclean mod and did corrupt some of my saves. So I wouldn't recommend going with Version 1 anymore. I'd have to fix Version 2 then. I bank much on Beth's SPF feature. It may be bugged, probably is bugged, but it should be the stabler alternative. Anybody else have this issue or were able to resolve it? Please see my edit. I didn't notice that it also requires apachii hair for males. Works great now. 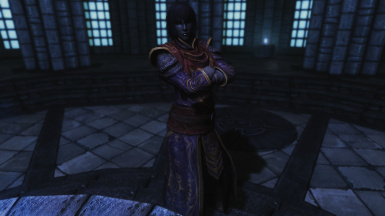 I discovered this when I clicked on the esp to move it in the load order, and noticed that the master esm's are skyrim, update, apachii, apachii for women, apachii for men. Once I installed apachii for men (already had the others), your mod works fine. Glad to hear that version 2 worked for you now! I see. I did create this while having ALL of Apachii SkyHair mod, including Apachii for Men. I should update the requirements then to stress this point. Version 1 worked OK for me. 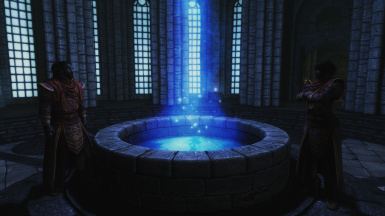 Version 2 crashes to desktop on skyrim load. Edit: Version 2 is working fine. I didn't catch that it requires apachii hair for males also. Sorry about that. Endorsed!